A player of mine has to get the Avalon Hill “Outdoor Survival” map for another project. He told me he hoped it wouldn’t compromise our game, or my campaign, too much. I wasn’t worried. Why? At this point, even though I’m the DM, I know very, very little about what’s on the board. With a few exceptions, and even though we’ve been playing for awhile, I still don’t know what’s in most of the towns, castles, and citadels. Many of the most important personalities in the “wilderness” have yet to make an appearance. 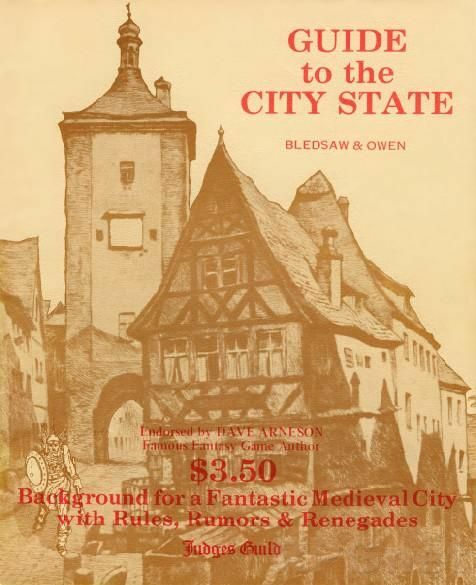 Each time his party gets to a “building” or a “basin” on that vintage Avalon Hill map, I dutifully follow the original rules and roll to see who – and what – happens to be there. It’s as much a surprise to me as it is to the players. Afterwards, I take notes and the campaign gets more detailed. In a few years, assuming steady play, I might have quite a little resource book. But it’s an ongoing process and never a foregone conclusion. If my friend starts his own campaign on the same board, the results won’t be the same. I still have to force myself to trust that randomly rolled adventures and encounters like this are going to work. And I’m still astonished, time after time, by how well they do work. Letting it all go to chance rubs me the wrong way. 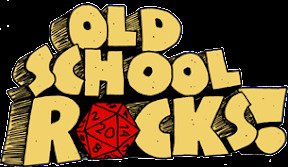 But the more I just follow the original rules and let the dice decide things, the more fun I have – each and every time. 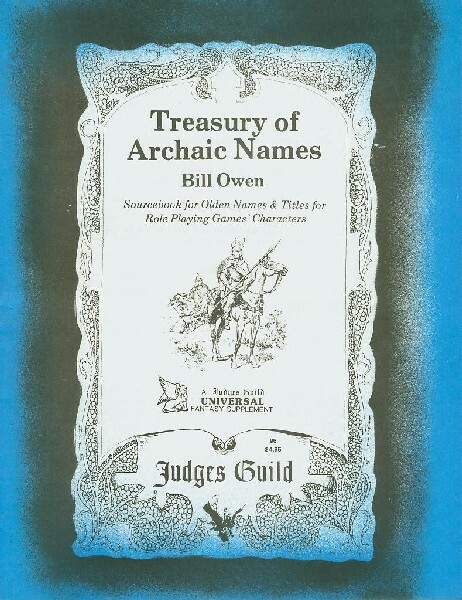 I’ve started to add another resource to the game: Bill Owen’s classic Treasury of Archaic Names from the Judges Guild. I have a copy of the second edition and… I… am… loving it! Though it may sound silly, I think this is one of the most essential JG products for “old school” play – right up there with Ready Ref Sheets. The random names combine perfectly with the random encounters. 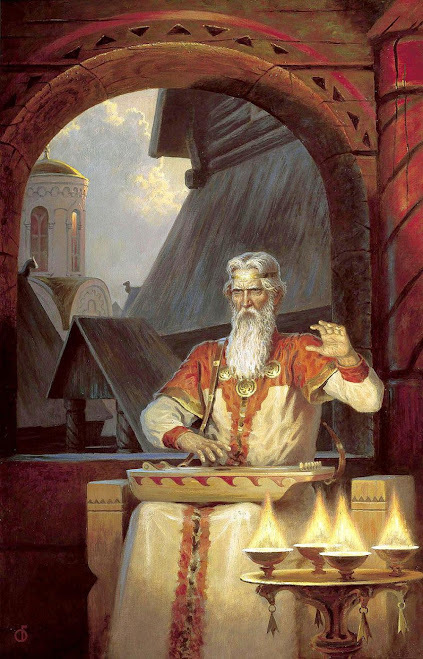 Once you’ve determined the character of the guy in the castle – fighting lord, magic user, or religious figure – you have to know his name and the names of his underlings. No one can keep making up original sounding names on the spot (I know I can’t) – but you can instantly roll GREAT and memorable names with this thing. I was loving it. Suddenly, the random characters the party encountered became that more fleshed out and real. Instead of some nameless guy working for the good wizard, you have “Shadworth.” I can picture this guy in my mind and – with the name as a lead – start to see his “back story.” Does he have a nickname? Yes! Roll it! Now you start to see where this guy comes from and what his “motivation” might be. Again, you have to trust that the names you are going to get are going to work. 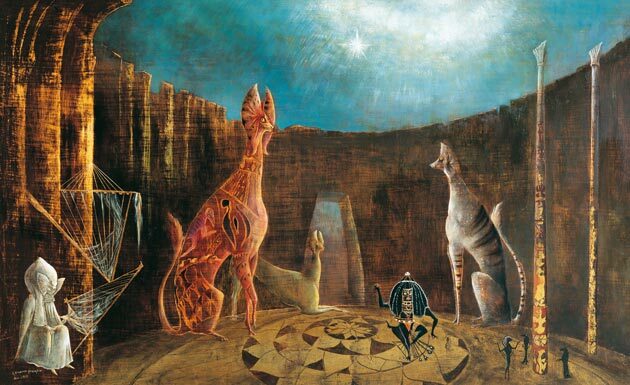 You have to trust in the randomness of it. But what happens when you do? 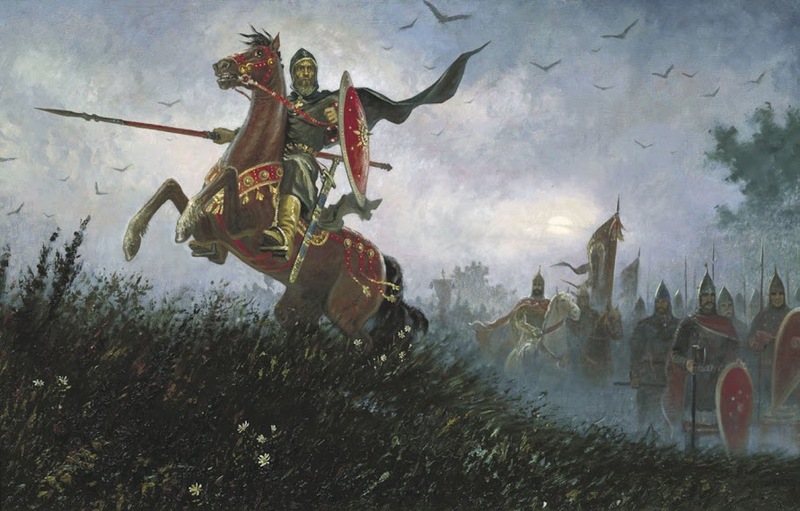 Everything is fresh and interesting – not just to the players, but also to the DM. It doesn’t need to stop with the names. Many people have expressed praise for all the cool heraldry on display in the very first edition of the “Greyhawk” folio. 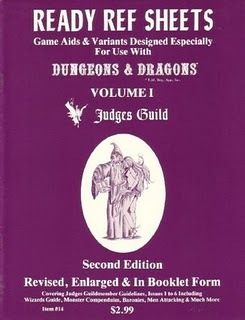 The Judges Guild provided tables to “roll your own” shields – both for players and NPCs. I can roll out the flags and shields for each one of the castles and citadels my players encounter – as well as all the names of the NPCs that carry those shields and fight under those flags. It goes against the grain to “trust the random.” But I’ve found that if you actually go out and get the Avalon Hill map give the OD&D rules a chance, you can have a hell of a lot of real fun. It’s worked for me every time I’ve done it. The new Traveller project over at Kickstarter mentions a principle called “MORAN” which means “Map Only As Really Necessary.” Otherwise, all you would do as the game master would be making maps. The same principle applies in OD&D. Relax and let the randomness help you. Great post. 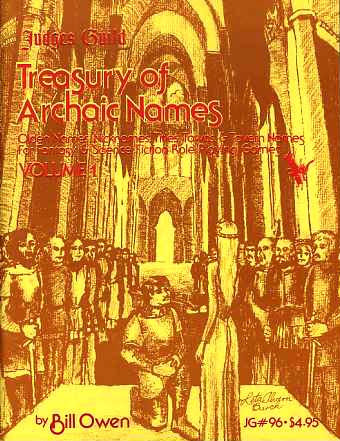 “Treasury of Archaic Names” sounds like an awesome resource. I’ve also been learning the truth of “trust the random”. 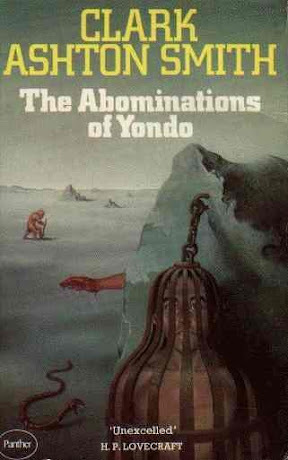 I think it’s one of those things that made OD&D work, but was lost over time. I’ve started referring to it as “map plus matrix”. 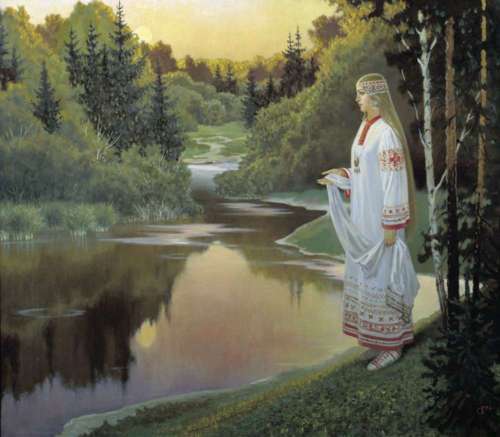 You have a location and you have a table to things that the PCs might encounter at that location. The rest is up to the creativity of the DM and the players AT THE TABLE. The players are responsible for motivating their characters. 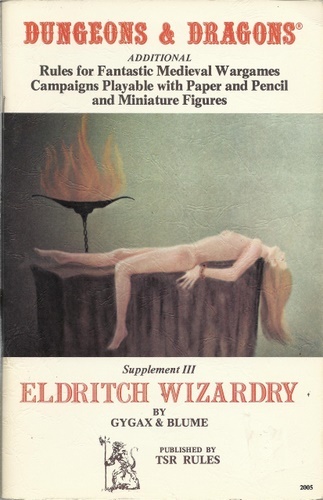 The DM is responsible for filling in the “texture”. The game takes care of the rest, but only to the extent that impartial arbitration is absolutely necessary. I started to roll random names at the game before this last one and it seemed to work. Yesterday, i tried again, hoping it wasn’t a fluke. It wasn’t. The random names really added to the game. I didn’t trust this book at first, and got a copy mainly because I wanted as many of the original JG products as i could find, but I was shocked at how much it instantly added to the game and the overall feel of the campaign.